Do You Have a Question About Sports Psychology? Please browse through these questions about sports psychology and mental training. If you don’t find answers to your questions here, please contact us to learn more about our sport psychology resources or Peak Performance Sports’ mental training programs for individuals and teams. Sports psychology coaching helps athletes (1) understand how the mind influences performance and (2) apply mental strategies to help perform their best in competition. We also help athletes improve practice efficiency and focus. You’ll learn how to mentally prepare for competition and how to take your practice game to competition. Sports psychology is not for problem athletes. We help you improve your performance using mental training strategies from sports psychology. What is mental game coaching or mental training? Mental Game Coaching (also known as mental training or mental toughness training) is the practical aspect of sports psychology. Mental toughness training helps athletes improve mental skills and overcome mental barriers, such as confidence, concentration (focus) or composure related issues. It requires replacing unhealthy attitudes and beliefs with healthy ones in order to achieve peak performance in sports. What’s the difference between sports psychology and therapy? Unlike psychotherapy or therapy, sports psychology doesn’t use couches, prescribe medicines, or work with abnormal behavior. Instead, the goal of mental game coaching and/or sports psychology is to teach athletes how to be more confident, improve focus, stay composed under pressure, practice more efficiently, and develop better pre-performance routines. The main difference between a mental game coach and a therapist is that mental game coaches work with athletes on sports performance enhancement and not personal challenges (e.g. working through a divorce, coping with an addictive behavior, etc.) or abnormal behavior (e.g. schizophrenia). Read more about The Roles of a Sports Psychologist. When should I work with a sports psychology expert? The most common sign that an athlete needs to work with a mental coach is when he or she is unable to perform up to maximum ability level in competition. This is often characterized when an athlete is able to perform well in practice, but seems to flounder or freeze up in competition. Smart athletes and coaches recognize the warning signs–an inability to cope with the pressures of competition, becoming easily distracted, or having difficulty with performance anxiety or fear of failure. Another situation in which work with a sports psychologist is appropriate is when an athlete is performing after an injury or in the recovery stage of injury and needs help working through issues, such as diminished confidence, which may manifest during the healing process. Read more about What is a Sports Psychologist. What kind of results can I expect from mental training? Sports psychology and mental toughness coaching is not a one-size-fits-all solution to performance issues in sports. Results vary from athlete to athlete and are contingent upon factors such as a desire to improve mental game skills, the ability to implement sports psychology strategies, and willingness to overcome the mental obstacles that get in the way of performance. However, anticipated outcomes include improved confidence; greater composure; keener concentration because of increased ability to cope with distractions; and entering the zone faster and staying there longer. Why should I work with Peak Performance Sports? For more than 22 years, Dr. Cohn and Peak Performance Sports have helped athletes improve their performance through mental toughness coaching. 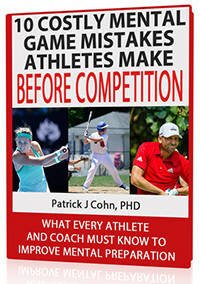 Dr. Patrick J. Cohn is one of the nation’s leading mental game coaches, combining the knowledge gained from his Ph.D. in sports psychology, hands-on experience working with hundreds of athletes, and more than 40 years’ experience combined as an athlete in football, hockey, baseball, tennis, lacrosse, and golf. Check out what others have to say about Dr. Cohn and Peak Performance Sports. Learn about Peak Performance Sports founder and mental training expert, Dr. Cohn, by viewing his bio. What mental coaching programs do you offer? Peak Performance Sports offers a wide range of mental training programs for both individuals and teams at the amateur and professional levels. The very best mental coaching program is the highly personalized and customized option is of working one-on-one with Dr. Cohn in person. Peak Performance Sports also offers phone, Skype, and email coaching mental training programs. We tailor our programs so that you can be sure to find one that fits your needs and schedule. How do I know if I’m a good candidate for mental game coaching? You should be consistently performing better in competition. You perform better in practice than in competition. You can’t concentrate in the now or are frequently distracted. You get upset with yourself easily after mistakes. Find out now if you’d be a candidate for mental game coaching – email us and request our one-page mental game assessment. What mental coaching program is best for me? Peak Performance Sports will help you select the best program for your mental game needs… Please call us at 888-742-7225 to discuss the options we offer to improve your mental game. When you start a coaching program, we begin with an AMAP (Athlete’s Mental Aptitude Profile) to assess your individual needs and how mental toughness training could best benefit you. We then develop a customized plan based on our mental game assessment system, focusing on your personal needs. Contact us with your sports background and to request information on our mental game coaching programs today! Do you work with athletes or teams in all sports? We work with any athlete, team, or performer who is open to change and motivated to improve his or her mental game. Our programs can be applied to any level of competition, including young athletes and parents, junior, high school, college or professional. We work with individuals as well as teams. Dr. Cohn’s experience is varied, but he has provided mental game coaching in sports such as: golf, auto racing, motocross, running, shooting, gymnastics, skating, soccer, tennis, football, basketball, baseball, softball, hockey, BMX racing, swimming, triathlons, skydiving, competitive sailing, billiards, and bowling. Our programs and assessments allow us to concentrate on the particular needs of each athlete, regardless of the specific sport. To see some of the feedback we’ve received about experiences of athletes in all sports, visit our client list. Can mental training help my child to perform better in sports? Mental training for sports parents and kids can help you identify the areas in your child’s mental game that are holding back his or her performance. It will also teach you the mental game skills, practice routines, and communication skills to positively impact your child’s performance. Learn how to become the Ultimate Sports Parent by visiting our Youth Sports Site. Do you certify mental game coaches, therapists, or sports-psychologists-in-training? Yes, we offer our exclusive Mental Game Coaching Professional (MGCP) certification training programs. If you’d like to help your athletes by using sports psychology techniques and skills, then either our certification program or our self-paced mental game coaching program will give you the tools to help maximize the potential of your athletes! You can also enroll in our online mental training programs and work at your own pace with over 500 pages of performance-boosting content. When can a team best utilize mental game coaching? Mental toughness coaching and sports psychology are helpful for teams who simply want to improve overall performance. As a coach, you likely know the symptoms that indicate that your team is not performing up to its potential, and mental coaching is needed, such as when athletes lack confidence, lose motivation, commit more mental errors than usual, or perform better in practice than during competition. How can sports psychology help my team? Sports psychology can help team athletes by enhancing confidence, improving focus, increasing practice efficiency, and building team unity. We can also help the slumping team identify why performance is below potential and how implementing mental game strategies can positively impact performance. What kinds of programs for teams are available? Our team programs are customized for your team. We initiate our team sports psychology coaching by assessing the needs of your team and creating a customized program that will combine seminars, clinics, workshops, and individual sessions to target the specific challenges you would like to address with your team. Contact us to build a custom program for you and your team. Our office is in Orlando, Florida and we meet with athletes in Windermere, Florida, which is close to Disney World and Universal Studios. However, we work with many athletes via Skype, Phone, or GotoMeeting Video Conferencing. If you prefer to meet in person with a trained mental coach, we can also suggest people in your area who are Mental Game Coaching Professionals certified by Peak Performance Sports. How do I find out more or get started? You can call us during regular hours–from 9-5 Eastern Time, Monday to Friday. Or you can send us an email and we’ll reply promptly. Contact us now by email to discuss your sports background and specific needs. Request our one-page mental game test to see if mental coaching can help you. Contact us now by phone: 888-742-7225 or 407-909-1700. The Role of a Sports Psychologist? Why Choose Peak Performance Sports?